Suffolk County Crime Stoppers and Second Squad detectives are seeking the public’s help to identify and locate a woman who stole a pocketbook from an Elwood store. 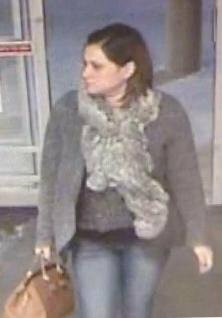 Elwood, NY - January 29th, 2014 - Suffolk County Crime Stoppers and Second Squad detectives are seeking the public’s help to identify and locate a woman who stole a pocketbook from an Elwood store. On Wednesday, January 8th, a woman was shopping at the Stop and Shop, located at 3126 Jericho Turnpike, when an unknown female stole the victim’s pocketbook from the shopping cart. The suspect is described as a white female with brown hair. She was wearing a grey sweater, grey scarf, blue jeans and light brown boots. She fled in a white 4-door sedan. Suffolk County Crime Stoppers offers a cash reward of up to $5,000.00 for information that leads to an arrest. Anyone with information about this crime is asked to call anonymously to Crime Stoppers at 1-800-220-TIPS. All calls will be kept confidential. Subject: LongIsland.com - Your Name sent you Article details of "SCPD Crime Alert: Woman Wanted for Stealing Pocketbook at Elwood Grocery Store"